In an ever changing hobby, we are constantly looking for newer ways to add things to our builds to bring that human element to dioramas and vignettes. MiniArt Ltd has made a point to offering many different figure sets to accompany their constantly growing line of model kit. One new contribution to the effort of bringing life to our works is the MiniArt Ltd Miniatures Series figure set; French Civilians ‘30s – ‘40s. This is a five figure box set designed around civilian characters from the 1930’s and 40’s. This was forethought as an addition for their recent European Tram sets. 1 – Parts legend which accompanies the instructional chart located on the rear of the packaging. Looking over the sprues I found many nice detailing aspects to the figures as a whole. The clothing is, for the most part cleanly molded with very little in the way of seam line outside the obligatory seam lines on the front and back of the legs and arms. All in all, the base frames of these figures are not too bad. As you would figure there is no written description provided with the set to explain any background on the figures themselves as they are to be pretty much a generic representation of a collection of individuals from the period timeframe. All of the clothing looks to be or close to be as we would see from this time period in history. The three non-civil servants supplied in this set could honestly be from a wide range on the historical timeframe. The elderly gentleman and the bakery delivery man could fit right into a modern scene and most likely not even get noticed and other than the Fedora hat atop the business man there is nothing standing out to put a time placement on the individual figure. The two civil servant type figures, the French Priest and French Police Officer are indicative of the time period. The Priest garb, robe or uniform if you will is that of a Jesuit Priest from the middle 20th century. The Police Officer dawn a period cloak and the standard issue pill box style cap warn at this time. Onto the heads and hands in this set. There is quite a bit of flash on the heads and hand provided in this set. The mold process places the center-line on the heads directly down the nose through the mouth down under the chin. I don’t think this is the most desirable point to make a mold seam as it is not too easy to remove the seam from the area around and including the lips. This is not impossible, just a bit of patience will be needed to smooth out the line without changing the facial features…then there is always the option of sort other aftermarket heads offered in the modelling world. Although the seam line on the hand do not traverse the back of the hands which would be much more noticeable the same flashing issues do apply here. Around most of the finger tips there is a considerable amount of flash and build up especially around separated digits such as the thumbs. All of this is correctible, but again, some time and patience will be needed to smooth out these areas without lessening the details. I had the opportunity to construct these figures for this review. For the most part, the fit was decent. The leg sections all met up with each other with no sanding required. Only two out of the five figures needed a little sanding to make the match-up between the legs and torso tight and free from gaps. All of the arm, hands and even the bread basket fit together with very few issues. The clothing extension pieces provided for the Police officer and the Business man will need a little working to make them fit seam free. These pieces just have a particular line up when placed on the base figures and need a little adjusting to get the seam to a minimal to allow a light sanding after. The MiniArt Ltd French Civilians ‘30s-‘40s figure set is a warm welcome to the overcrowded field of military add-on figures on the market today and although MiniArt Ltd has an earlier release of their German Civilians Set, this is a great start. I do feel we need to have a constant adding of military type figures to support the builds, but there is a small number of decent commercially offered civilian figure sets for sale out there that can be sold at this one’s valued price. With the exception of the flash issue on the head and hand sections of the figures, this is a great little set to help spruce up anyone’s build if they are looking to add a civilian touch to the scene. I found pricing of this set above and below the listed MSRP of $14.00 US. Highs: A welcomed addition to the building world, some fine details at a decent price. Lows: There is some flash that will need some attending to but patient steady work they will clean up in no time. Verdict: I recommend this set to anyone needing additional civilian characters for their build. There will be some clean up involved but patience will prevail here. The Priest figure will probably look familiar to French modellers as it will remind them of Don Camillo (impersonated on screen by French actor Fernandel in the 50's and 60's) : H.P. Spot on Heri-Pierre!! I actually went searching and found some that made the robe look plausible...but I am guessing they made the mold after that picture!! I think the sideways mold does have a lot to do with it Hirsham. That and I wonder if these were rushed to market due to the recent relocation of the company. 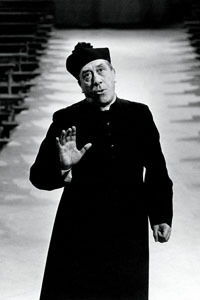 The only problem is that Don Camillo's adventures are set in Italy http://en.wikipedia.org/wiki/Don_Camillo H.P. Well he was French at least! Thanks Christophe! I would expect a little clean up, as it is an injection mold process but the heads, for me at least would seen to be the bigger hassle. One thing to remold an ear or two but from the bottom of the nose to the chin can be problematic for some I suppose. Generally there are decent pieces and start to hopefully more civilian type subjects.